The USS George Washington was a nuclear powered ballistic missile submarine built by General Dynamics and commissioned by US Navy in 1959. It was the first submarine capable of launching an intermediate range ballistic missile (Polaris). The submarine was 380 feet long with a submerged displacement of 6,700 tons. She was de-commissioned in 1985. The kit consists of 124 discrete part numbers and a total piece-part count close to 200. The kit had already been opened when I received it (thanks for the kit Ray), so I do not know how the parts were originally packaged. 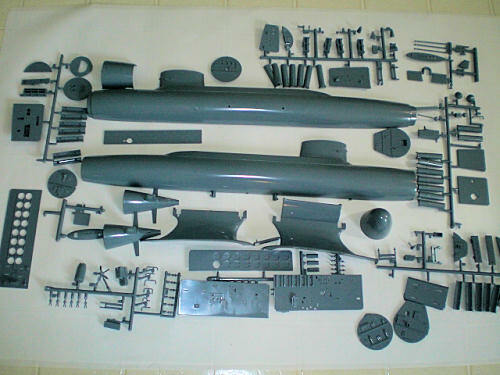 The parts are of good quality and molded in grey. 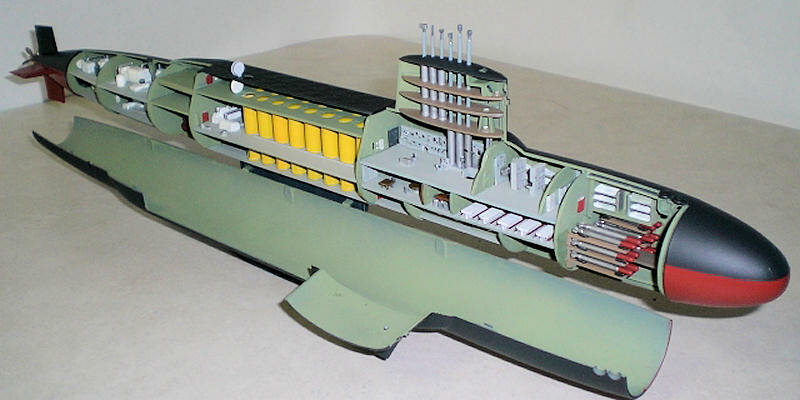 The model is designed with the starboard half of the hull hinged, allowing it to swing down from the closed position and reveal the complete interior of the submarine. 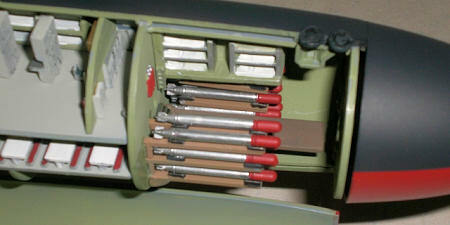 One missile tube can be assembled with a small coil spring to allow for the launch of a missile provided with the kit. A detailed two sided instruction sheet accompanies the kit. Part names are given and basic colors are called out. Detailed art work of the subject is on the box cover. The small decal sheet contains the submarine’s name and number for the sail. 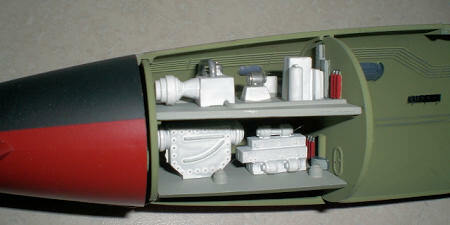 Note: To facilitate painting the exterior of the sub, I deviated from the assembly sequence in the instructions. I started out by painting the bulkheads and interior of both hull sections. I fully assembled the stern section first (instruction step #9). Next, the hulls were taped together and the stern assembly and bow were glued in place to the port hull only. After the glue dried, the starboard hull was removed. This process ensured the starboard hull would open and close with a minimum of fit work later. At this point, the submarine’s exterior was painted. My thought was that it would be much easier to mask an empty port hull rather than trying to mask over the interior bulkheads and other fixings after assem bly was complete! With the kit completed, I believe this was the right move. The other out of sequence move was the installation the sail decks at the end of the build instead of at step #2. My reasoning was that all of the handling of the model during the build process would likely have broken them off. I test fit everything prior to gluing. Many of the decks needed to have their ends sanded in order to slide smoothly into the bulkhead slots. Assembly of the missile tubes/decks required some extra work. There are 3 decks and two rows of 8 tubes. I drilled the mid-deck missile tube holes open to attain a loose slip fit for the tubes. At this point I painted the tubes and decks. The ends of the decks needed to be sanded to obtain a loose sliding fit into the bulkheads. After an unsuccessful attempt at assembling all 16 tubes with the decks at one time, a new strategy was used. I first glued the 4 corner tub es into place on the lower deck, slid the mid deck over the tubes (There is a rib on the tube about two thirds of the way down that the mid deck rests on) and carefully slid this assembly temporarily into the hull to attain proper alignment before the glue on the tubes was fully dried. When the tubes were fully dried, the assembly was removed from the hull. With the mid deck off the tubes and working upside down, I dropped the remaining tubes in place in the mid deck and placed the bottom deck over the bottoms of the tubes. Turning the whole assembly right side up, each tube was tweaked as needed to locate it properly in its spot on the lower deck. 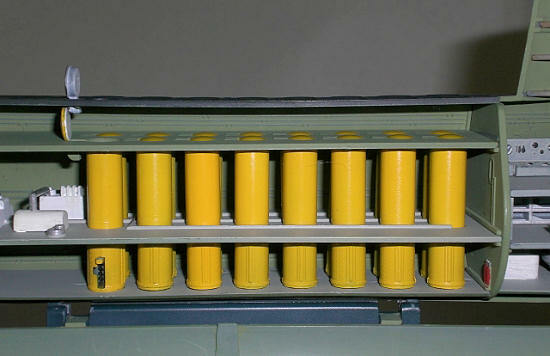 I used a drop of white glue where the back side of each of the tubes contacts the mid deck to hold them in place. 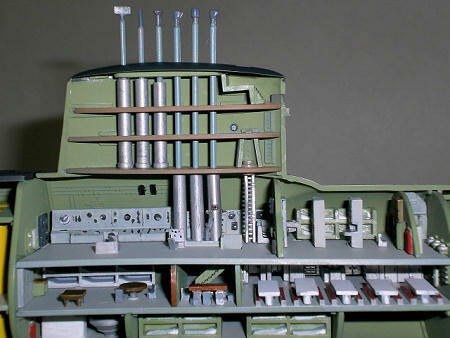 The tube/deck assembly and top missile deck were then glued into the hull. The stand required some extra effort as well. The port half of the stand glues to the port hull and the starboard half of the stand captures the hinge pins on the starboard hull and is then glued to the port stand half. Prior to gluing anything here, a test-fit revealed that the starboard stand half needed to be trimmed and sanded to allow the hulls to fit together. I sanded the starboard hull ends a small amount as well to allow the hull to rotate open smoothly. Plastic enamel was used for the entire model. For the topside color I added a bit of grey to black. For the lower surfaces anti-fouling paint, I added a bit of orange to red. The instructions referenced colors for most of the parts. Some photos I found showed no numbers painted on the sail so I opted to leave them off. With the hull in the open position, the exterior of the sail doesn’t show.